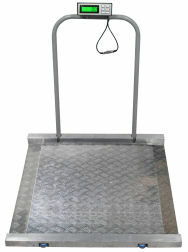 The LWC wheelchair scale is a accurate and reliable scale with all the features you need to weigh quickly and accurately. This scale features a power saving auto shut off feature, large backlight, and hold function. A Zero function allows you to zero out containers and a backlight display comes on when the scale is active. Calibration (needed rarely) can be performed with any mass of know weight which means no more expensive calibration weights.